Solar kits help you to convert solar energy into electricity, which you can use to charge RV batteries, appliances, and heater. What is all included in a solar kit? A typical solar kit includes solar panels, obviously, along with an inverter, panel racking, sundry electric supplies, cables, and other connectors, charge controller, nuts and bolts, and an instruction manual to guide you through the installation process. In simple words, when a solar panel is exposed to sunlight or solar energy, it creates an electric current. It travels into the charge controller that adjusts the amount of current the battery can take at one point. The battery converts the charge into DC, which is then sent to the inverter, which turns it into AC power, which is commonly used to run small appliances, charge smartphones and tablets, and power up computers. These kits are available in a variety of sizes, so bigger the kit, more power it generates. The primary power source is inexhaustible. Even if you are up in the mountains in the winter, you get a few hours of sunlight, which are enough to generate power. You are producing green energy. Your sustainable choices will encourage others to protect the environment. It is virtually maintenance-free. Once you install the entire set-up, you aren’t going to move it, so there are zero chances of it breaking. If you want to expand the set-up, you can just add around without moving any panels. RV batteries have a lifetime of up to five years, and that’s because they are continuously in use. When you compliment them with a natural power source, it takes up at least 50 to 75 percent of the load. The battery life extends to around eight and sometimes more than ten years. You are just out there, living your life and helping the environment grow. It doesn’t get any more perfect than this. The entire solar panel is made using one silicone crystal. It is made up using several pieces of crystal. Amorphous panels are extremely thin film panels attached to a thick backing panel for support. It is also the cheapest of the three. The type of solar panel you choose depends on your RV size. Amorphous is twice as efficient as monocrystalline and polycrystalline panels. However, the monocrystalline variant works better in low light conditions. Polycrystalline panels require the least space. The choice is completely yours. Ask your friends or other RV users what their experience was and only then come to a decision. The better choice: rigid or flexible solar panels? As the name suggests, rigid panels are firm and has an aluminum frame. It is highly durable and withstands rough weather and extremely bumpy rides. It also has high resistance to heat. If you plan to use the RV for a long time, investing in a rigid panel is better compared to more expensive flexible panels. You can mount it on a hinge, so that it stays tilted. However, it comes with a few disadvantages. It is extremely heavy and difficult to place between antennas, AC units, and other electrical components. Even though they are unbreakable, they are made with glass, which, like we all know, can break. A flexible solar panel is a recent technological development. It is lightweight and available in both monocrystalline and polycrystalline styles. It is made using silicone and can be installed directly on your RV roof. However, flexible panels crack under pressure, which reduces their power-generating capacity. For us, a rigid solar panel is a better choice because it leaves some space between the set-up and the RV roof. It helps you to keep your vehicle cooler and is also a suitable option in extreme climatic conditions. Again, this is something that depends on your RV size. However, for an average-sized RV, two panels that produce 120 watts of output together or one panel generating the same amount does the job. The Renogy 200 Watt 12 Volt Monocrystalline Solar Starter Kit comes with a Wanderer 30A PWM solar charge controller. It expands your set-up output to a maximum of 400 watts. You can turn it into a negative grounding controller by reversing the batteries to avoid chances of a short circuit. The solar kit is easy to install and can produce up to 1000 watts per day. It can completely charge a 50Ah battery from 50 to 100 percent in only 90 minutes. It comes with an eight feet 10 AWG Tray Cable to connect the charge controller with the battery, one 20’ 10AWG MC4 Adaptor Kit, one set of MC4Y connectors, two Renogy 100W 12V Poly/ Mono Solar Panels, two sets of Z-brackets, and the controller like we mentioned earlier. You can choose between the type of solar panel you want. Monocrystalline is more efficient and a more durable choice. However, if are low on budget, go for a polycrystalline panel; it works great too. Renogy offers 25 years warranty on power output, five years warranty on material and workmanship, and one-year material warranty. A superior module conversion efficiency model, Renogy KIT-RV200D Solar Panel Kit produces an output of 1000 watts per day on a sunny day. It is fitted with a corrosion-resistant aluminum frame that prolongs its life and quality. Renogy’s panels last for more than ten years without needing any repairing. Also, they can withstand extreme wind speed of 2400PA and snow loads of 5400PA. The kit has a bypass diode, which reduces the power drop caused by shade to continue outstanding performance in low-light conditions. It is available in four sizes including 100, 200, 300, and 400 W so that you can pick one depending your RV size. The panels have a back sheet of TPT, which reduce heat loss and ensure uniform performance during its lifetime. It also comes with an Adventurer 30A PWM charge controller that assists in flush mounting and is grounded negatively for battery compatibility. 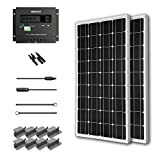 The package includes 100 watts 12-volt monocrystalline solar panel, mounting Z brackets, cables and connectors, and the charge controller. You will receive 25 years warranty on performance, five years warranty on material and workmanship, and one-year material warranty. If you don’t like the product, you can return it in 60 days. 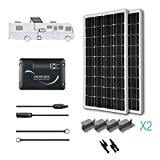 The WindyNation 400W Solar Kit includes a four solar panels, 30-Amp LCD solar charge controller with a battery temperature sensor; UL Listed 12 AWG solar cable and all required connectors. The controller comes with user adjustable settings, which makes it an ideal pick for your RV. It displays voltage, amp hours, amperage, DC load draw, and temperature. The panels generate 1600 watt or 135 Amp per day of charge. WindyNation will give you 25 years of warranty on power output, five years on the solar panel, and one year on all other components. You can also purchase the kit with 300ah or 400ah AGM Battery. You will have to DC-to-AC inverter, and your entire sustainable system is ready to be used. Virtually maintenance-free, Go Power! Weekender SW Complete Solar and Inverter System Kit is your one-stop solution for green power. You can use it to run your television, charge mobile and laptop, and run small appliances. The kit includes a 160-watt solar charging kit and 1500 watt pure sine wave inverter system. You can purchase two kits separately to boost your RV’s green power. It ensures a fast charging with smooth and uniform power supply even on cloudy days. The affordable all-in-one kit comes with a 25 years warranty on power output and performance, five years on the solar panels, and two years on other parts. The Goal Zero Yeti Solar Kit includes a Yeti 1250 Portable Power Station, one roll cart, Boulder 100 Briefcase solar panel with cord and kickstand, and a wall charger. It also includes a 1250Wh lead-acid battery portable power station, which can power up ten devices at a time. You can couple it with more 100Ah lead-acid batteries to ensure a longer runtime. It requires zero maintenance, doesn’t make any noise, and doesn’t generate fumes. You can charge and use it at the same time. The kit comes with a 30 days money back guarantee and one year manufacturer’s warranty. This Solar Panel Kit from Renogy is our top pick from top pick from the list. Available in four different sizes from 100 to 400 watt, the kit comes with 25 years warranty on power output and performance. It also has a 60 days money back guarantee. The solar panels can bear extreme wind speed of 2400PA and snow loads of 5400PA, which makes it a perfect choice for someone traveling to Idaho, Colorado, or Alaska in the winters. It a complete kit, which means you don’t need to buy anything else to install it. Also, Renogy offers excellent customer service.